The new Carl Friedrik visual identity is the result of a collaboration with the creative agency Two Times Elliott and tireless efforts of our own team. Here we’d like to expand on some of the elements of the new brand. We’ll also share a little on what’s coming next from Carl Friedrik. Keeping our logo simple and clean was a top priority for us. Set in a classic grotesque (sans-serif) typeface, the Carl Friedrik logo is modified to be clearly legible in sizes from a small embossing, to a large store sign. Complementing the otherwise straight lines, the curved Rs lend the name a touch of character otherwise missing from minimalist’ logotypes today. You might have also noted two thin lines at the top and bottom of our visuals, website, and throughout our packaging. The lines are referred to as an anchoring device and is a core element of the Carl Friedrik identity. 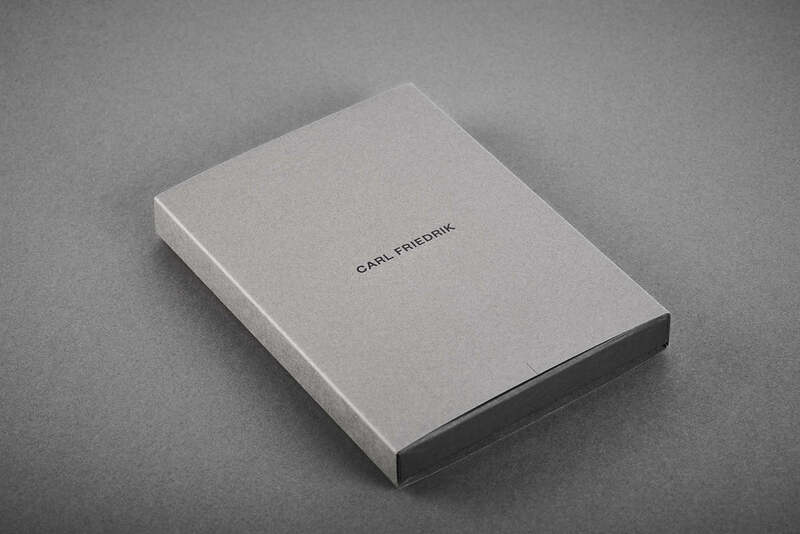 On applications where both lines are visible on the same medium, such as our packaging, the anchoring device is neatly framing the Carl Friedrik logo. On our website the anchoring device is found on the top and bottom of the website to assist the centered division between content elements. As you might have noticed throughout the years, we have adopted a blade shape as a symbol for our products. What started out as the shape where the handle is stitched onto the briefcase, has become a symbol that’s used throughout our entire product range. After a few tests, we decided to adopt the blade symbol as the outer logo also for our bags. We technically had already made this change before the rebrand, but figured now would be a good time to expand on the why. Another, more subtle, change comes in the form of personalisation: We're pleased that we can now, through a removable patch on the bag’s interior, personalise all our bags. We’ll still offer personalised luggage tags for those who prefer the accessory or to have their name or initials on the outside of the bag. Our next big project is the launch of our new collection, which will be designed for the urban commuter and business traveller. The collection will feature new product categories, new materials and smart features and will be revealed here shortly.